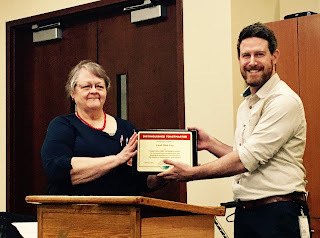 Crosswinds Toastmasters: Leah Cox earns Distinguished Toastmaster Award! On July 18th, former Crosswinds club President, Leah Cox was awarded the Distinguished Toastmaster (DTM) award! Ten years in the making! Earning the DTM is no small deal! It represents the highest level of educational achievement in Toastmasters. Congratulations Leah for continuing to mentor and improve our club with your wealth of experience. This accomplishment also helps provide our club status in achieving its yearly goals!